One of the best things that you can do for your health is to get sufficient and good quality sleep. After a long tiring day, a good quality sleep allows your body to reboot and reset, balance hormones and control stress. Failing to get proper sleep can lead to weight gain, impaired functioning and higher risk for chronic diseases. Reduction in the risk of the other issues related to chemical and poor-quality mattresses such as back and neck pain, SIDS, fertility problems and much more. Herbal mattresses are made up of natural components such as wool and cotton. If you are ready to invest in a good quality organic and herbal mattress that features some of the best health benefits, we have listed here some of the best herbal mattresses to help you find the one that best suit your needs. Let’s go through it! It is designed to reduce the problems that affect the sleep quality and health. It comprises the thin layer of bamboo charcoal to provide ultimate comfort. If you are willing to maintain the bed hygiene and healthy body, these mattresses are highly recommended by the sleep experts. There is no denial of the fact that green tea is a good health catalyst. The best part is that the goodness of green tea can be now found in your mattresses too. 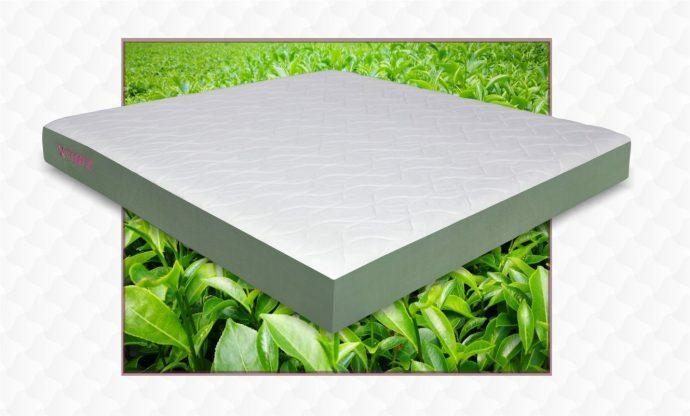 Green Tea mattresses have the perfect blend of high-mountain green tea extracts and memory foam. It supports the body and complements the room temperature. The best part is that it does not have chemical-based ingredients, unlike conventional mattress. The qualities of green tea add extra comfort to the deep and sound sleep. Sleep like a baby in the mattress made from Certi-PUR certified foam. When you buy Certi-PUR certified foam mattress you can have peace of mind that your mattress has no ozone depleters, no heavy metal, no prohibited phthalates, no BPDE and no formaldehyde. Don’t lose another night’s sleep worrying about the mattress. Ensure that your mattress is not causing any harm to you and your family. Make the switch today to the herbal mattresses and enjoy the eco-friendly and comfortable sleep.